If you're wondering why Jalopnik reviewer Alex Lloyd declared that a person who's shopping for a midsize sedan would be an "idiot" not to choose the Fusion, visit Peoria Ford for a test drive today. We know the Fusion well, so it's clear to us why automotive critics love this midsize sedan so much. Whether you're searching for the new 2013 Ford Fusion or Ford Fusion Hybrid near Phoenix, Tempe, Mesa, Scottsdale or Avondale, you'll find what you're looking for at Peoria Ford. We have several trims for local car shoppers to choose from, with many features and colors available. Scroll down to read Peoria Ford's full review of the 2013 Fusion and learn all about its EcoBoost and gas-electric powertrains, incredible fuel economy ratings, safety features and cabin amenities. If you're looking for even more details, visit the Fusion's digital showroom; you'll find links for this below, as well. Once you've had a chance to check out the review, you'll see why U.S. News & World Report gave the Fusion and Fusion Hybrid the top two spots in the Affordable Midsize Car category. Compare the 2013 Ford Fusion to vehicles like the 2013 Chevrolet Impala, Toyota Camry, Kia Optima, Hyundai Sonata and the Subaru Legacy, and you'll catch that the Fusion ranks above the competition in various areas. See our Quick List below to find out why! How much can I get for my trade-in? 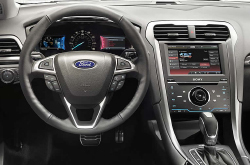 Take a peek inside the 2013 Fusion - view video now! Don't go to a national auto repair center in Phoenix, AZ when Peoria Ford's spectacular repair techs are just a brisk journey away; plus you'll get a long warranty on every job and access to authentic OEM products. Peoria Ford's well-versed mechanics will keep your Fusion in outstanding physical shape. We will undertake a chore as simplistic as an oil change, or complete challenging auto repairs and service like timing belt replacements, strut and shock repairs and Ford transmission rebuilds. From the simple to the complex, Peoria Ford covers it all and offers fair prices, personalized service and old pros mechanics. The link underneath this text is your boulevard to savings! Click now and you'll be lead to to our coupon specials page! At Peoria Ford, we want our customers to have the best vehicle ownership experience possible, and that starts with finding the right car for each and every one of our customers' lifestyles and needs. That's why Peoria Ford provides comprehensive reviews like this one. 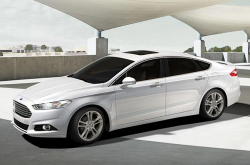 Now that you've learned about the hybrid and gas-only Fusion sedans, visit our Ford dealership near Phoenix for a test drive and put the 2013 Fusion to action on the road. During your test drive, you won't just have a chance to experience the Fusion's performance, but also its many high-tech features. Try out amenities like the Titanium's rear parking sensors and optional blind-spot monitoring system, as well as many other features. Fill out a quick contact form or give Peoria Ford a call to setup an appointment with one of our sales representatives. Your rep will answer any questions you have about the Fusion, give you a tutorial of all its features, and go over current manufacturer and dealership specials that could help you save money. You may also simply stop by during our regular business hours to check it out and take a spin in the Ford Fusion around the Phoenix metro area. We look forward to your visit!